The Samsung Galaxy Tab 10.1 may well be the best-looking Android tablet in the market right now. And I’d say it possesses the best customised Android Honeycomb interface thanks to Touchwiz UX. I was fortunate to get a review unit within a week of its launch in Singapore and so I’m here to give my review on this attractive device. The Tab includes, besides the usual charger, a pair of earphones, one of the few tablet makers to package in the box. The USB cable doubles up as charging cable, its length is rather short. The tablet in the box is protected with separate pieces of plastic front and back. The plastic is so tightly stuck to the glossy back surface that I am happy to leave it on as a protection against the white scratchable surface. The Tab is the slimmest tablet for its screen size, a hairline thinner than iPad 2. It has a slightly bigger surface area than Motorola Xoom. Comparing thickness between Galaxy Tab 10.1 and iPad 1. The back is flat, not curved like iPad 1 or Asus Transformer, and that makes the Tab extremely slim and easy to slip in your bag. Running on dual core 1GHz Tegra 2 processor, the Tab has 3 hardware buttons located at the top left. The volume rocker direction is uniquely swapped: press the left to reduce volume, press the right to increase. This is in alignment with the on-screen volume indicator, but if you use the Tab in the portrait orientation, you would need to press down to increase volume. The speakers are located at the upper area of the tablet, so you won’t block the speakers when holding the Tab naturally. The glass surface is less reflective, which makes viewing more comfortable. The surface also feels smooth to the fingers when swiping, and finger prints are easily wiped off. Audio quality is pleasantly balanced for long periods of listening. The exterior is entirely made of plastic which is easily dented. I have already dinged the volume buttons and I have no idea how I got the scars. It was certainly not due to drop as it looks more like scratches. See picture below to be the judge (click to enlarge). The Tab has, in my opinion, the best Honeycomb interface customised. 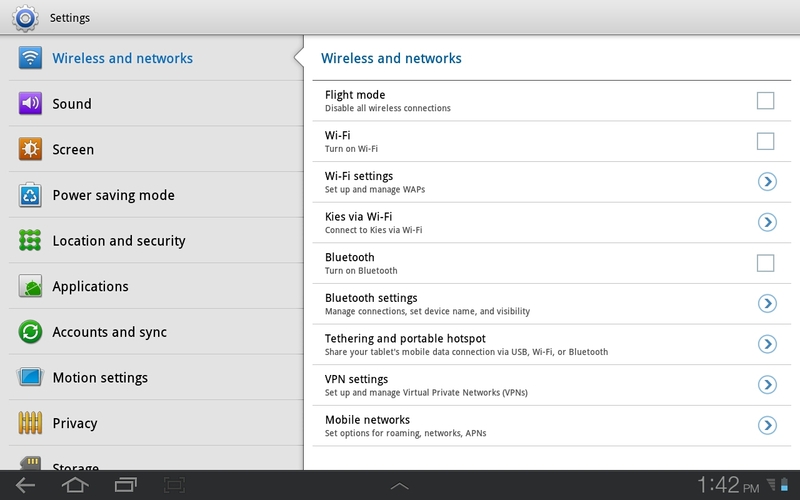 If you are familiar with the Galaxy S phone interface, then you will feel right at home with the Tab. All the menu icons are splashed in full colour, and the font sizes are made bigger to ease viewing. The slide-out notification pane has the usual short-cut icons allowing you to manage your Wi-Fi, Bluetooth, Sounds, Flight Mode, etc. Stock apps like File Manager, Music Player are all customised with multiple columns to improve usability. The Tab even has the familiar vibration feedback as you type or when receiving incoming notifications. Samsung has its TFT LCD screen colours heavily boosted to make images look more vibrant without appearing unreal (until you do a visual comparison with the competitors). The other customisation to the OS is the MiniApps. Select the up-arrow icon in the middle of the status bar and a row of apps slide out – Task Manager, Calendar, World Clock, Pen Memo, Calculator and Music Player. Click on any of the apps and it will appear as a floating window on top of your existing screens. You can use the floating app and navigate the main screen at any time, and the floating app will remain on top at all times. You can choose to “maximise” the app, and in doing so the MiniApp will close and the actual full-screen app will be loaded. 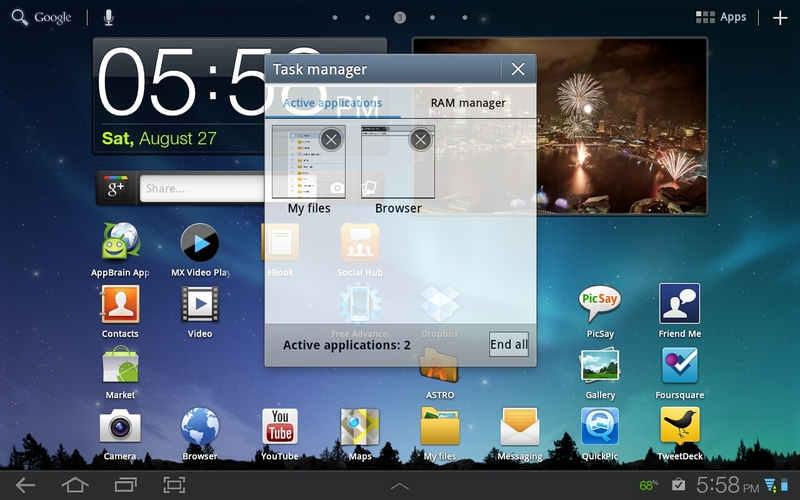 This MiniApp implementation is Samsung’s solution to multiple-window multi-tasking. For now, the list of MiniApps are not customisable. Besides the standard Honeycomb soft-icons to the left side of the status bar, the Tab has a fourth “Screen Capture” button for ease of snapping the screen contents. The button can capture almost every screen on the Tab (even the camera preview), except when the MiniApp dock appears which hides all other status bar information. Unfortunately, all the wonderful customisations have put a toll on the Tab. It is noticeably more laggy in between finger swipes and icon selections, so this would certainly put a dent on user expectations. Ironically, with all the greatness of the interface, the 3mp rear and 2mp front camera quality are not to be taken seriously. It is a pity considering the camera app has many shooting modes and custom settings like metering mode, focus mode, white balance and exposure compensation. Just like all the other Tegra2 Android tablets I have tested, the Tab fails to play my reference MP4 and MKV video files smoothly, even when using third-party software-decoding video apps. The playability is a far cry from Galaxy S2, and even my single-core Galaxy S plays the same files without missing a beat. Battery performance on 3G network is quite good. When I turn on auto-sync for Gmail and corporate mail, sets Tweetdeck to refresh feeds every 10 minutes, and check on the Tab regularly throughout the day for mails and social network feeds, the Tab uses up just 50% in 16 hours. The Tab does not come with generic connectivity ports like HDMI, memory card slots, or USB. However, there are official adapters that allows you to do all the above. The Samsung Galaxy Tab is light, thin, delivers striking colour display, has good battery life, is easy to operate with customised interface and apps, and 3G-enabled for data access anywhere. Almost perfect… just marred by laggy interface, uninspiring camera quality, and underwhelming video performance. Still, don’t let it stop you from owning the best-looking most user-friendly Android interface in the market. Absolutely beautiful review on the Galaxy Tab. Too bad they're not able to sell them in Germany. I think that Apple suit is just a bunch of lies lol.